Pilsbry was among the most productive taxonomists ever to pick up a magnifying glass; in all he published some three thousand articles (around twelve hundred in his journal Nautilus alone) and described and named going on six thousand forms. Pilsbry's immersion in the world of shelled creatures was so intense and over such a long period (he published writings in a total of eight decades) that he became a veritable institution. He worked on both freshwater and marine organisms, extant and extinct species, and American and foreign forms. Further, his studies extended beyond mere descriptive work; he was interested in ecology and biogeography as well, and made contributions relevant to oil exploration activities and epidemiology. In addition to his attention to molluscs, Pilsbry was also the leading expert on barnacles. 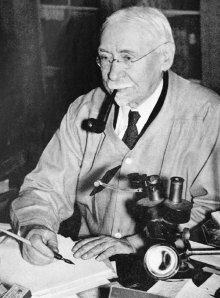 Pilsbry spent many an hour in his lab at the Academy of Natural Sciences, but he actually also spent a fair amount of time in the field, collecting specimens in the U.S., Hawaii, Central and South America, the West Indies, the Galapagos Islands, Japan, Australia, and various South Pacific islands. --born near Iowa City, Iowa, on 7 December 1862. --dies at Lantana, Florida, on 26 October 1957. --National Cyclopaedia of American Biography, Vol. 47 (1965). --The Nautilus, Vol. 71(3) (1958): 73-112. --Proceedings of the Academy of Natural Sciences of Philadelphia, Vol. 153 (2003): 1-6.